Example frame & mat colour combinations. Customize your frame in 3 easy steps! You must tick one of the Boxes below! Line 1. Victoria University or ??? Line 2. Your Name or Your Achievement or ??? Line 3. e.g. 2014 or Date e.g. 3/9/2014 or ??? If you need a different frame size, mat colour or something special we will make it. Please Call 0438 511 218 For Assistance. Compliments the certificate frame you have ordered perfectly. The perfect touch to enhance the prestige of your Certificate Frame. Acid Free Materials: We guarantee all materials touching your Certificate are acid free. this is the most important feature of our Frames. The materials we use will not become acidic over time and cause permanent damage. This is the only way to go to protect your Victoria University (Testamur) Graduation Certificate. If you’re not 100% happy for any reason we refund your money. We Only Sell High Quality Australian Made Certificate Frames. Our Frames are handmade to fit your Graduation Certificate. Our price is significantly better than the University supplier. BEWARE of Cheap Certificate Frames for sale at $59, they are imported and poor quality. We Guarantee 100% Quality: As a premium custom framing business, when we make a certificate frame, we use the highest quality materials available. 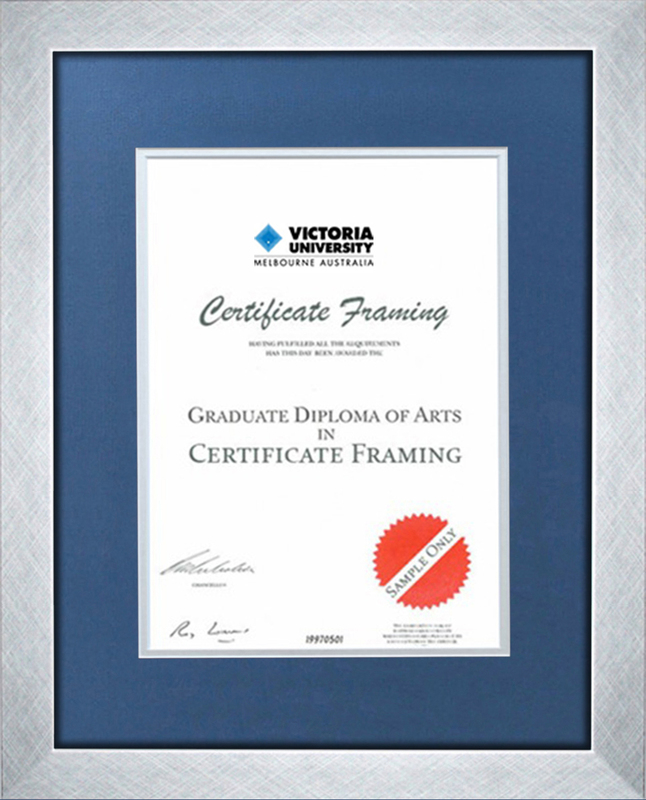 The Premium Italian Timber, Double Mats and Acid-free Materials we use will help preserve your Victoria University Certificate for a lifetime. The Frame: The timber we use is universally recognised in the industry as having two highly desirable characteristics, hardness and straight grain. This makes your certificate frame more resistant to chipping and cracking. This often occurs in inferior cheaper products. Prestigious Double Mats: Our frames include Double Mats. Double Mats do enhance the prestige of your frame, however most importantly this adds further protection from damaging pollutants and contaminants between your degree and the glass. Our Certificate Frames are custom designed to achieve a professional result. When attaching your Graduation Certificate to a mat (often called a border), it is important to only attach the Certificate from the top. This is called hinging and it ensures your certificate sits flat when fitted to your certificate frame. The reason for this is that when your certificate framing is completed and your frame is hanging on the wall it picks up moisture and condensation from the air and by hinging your Graduation Certificate it has room to expand which will ensure the certificate always appears flat. Simple and detailed instructions come with your Certificate Frame.